This little bird doesn't save the bright red cap for breeding season. It's colorful all year round. 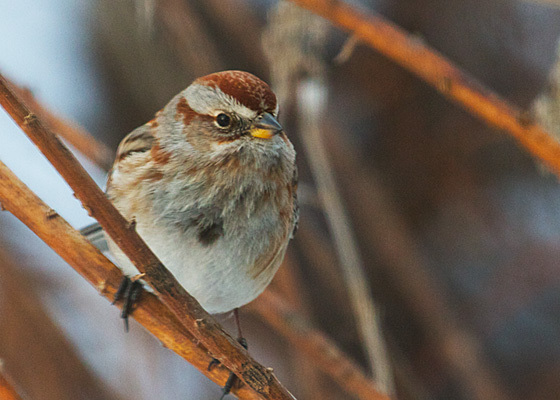 In the depth of Iowa's winter, a sprightly crowd of American Tree Sparrows bustles among snow-laden roadside weeds. 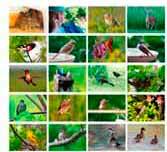 If you're in doubt about this bird's identity, look for the dark stickpin at the center of its breast. Tree sparrows winter throughout North America, except a row of states along the south and west borders. If you live where you sparrows are present at this time of year, enjoy them now. When the weather turns nice they'll all have returned to the extreme northern reaches of the continent. See map.